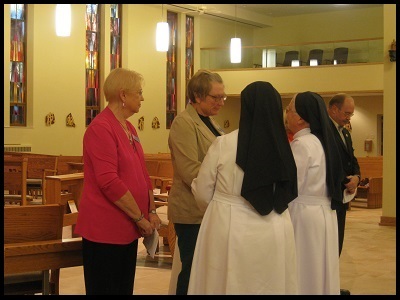 Sunday, September 14, 2014, the Missionary Benedictine Sisters welcomed four new members of the Oblate community. An Oblate is anyone who wishes to deepen their relationship with Christ by living the Rule of St. Benedict according to the Constitution of the Immaculata Monastery. During the year of candidacy, candidates learn about the Benedictine way of life, study the rule of St. Benedict and the Gospel. The main work of an oblate is deepening their relationship with Jesus through a life of prayer and interior silence. 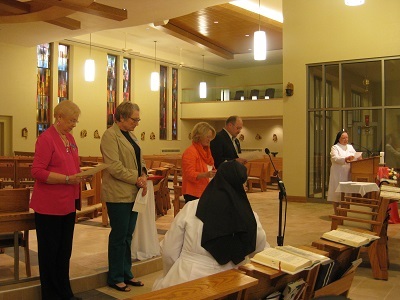 Oblates are encouraged to take time for prayer each day by praying the office of the Church and personal prayer, as well as to do something of service. 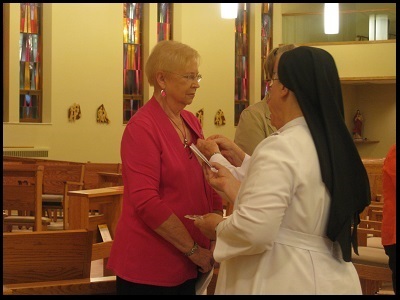 Candidates for Oblation were Mary Jo Shemek of Tarnov, Nebraska, Deana Kurtenbach, Karyn and Keith Vrbicky all of Norfolk. 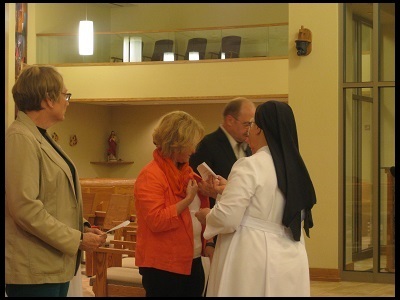 During the Oblation ceremony each candidate stated their intention, signed their oblation card and received a medal of St. Benedict from the Prioress, Sr. Pia Portmann. 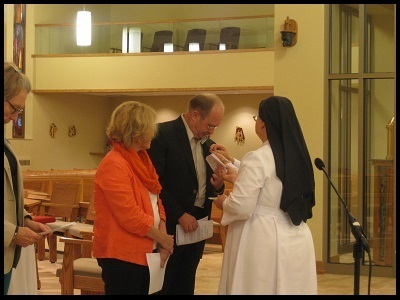 Congratulations to the new Oblates and may your loving gift of self be eternally blessed.